Heather Reilly was deemed the Noble Artist's Author of the Month for February 2015, for her short story based on the amazing fantasy artwork by Jamie Noble below. Please note that the artwork on this page belongs to Jamie Noble, and should not be copied or used in any way without his permission. His contact information can be found at the Noble Artist. Click on the links to check out the Noble Artist's site, and the Author of the Month Competition. You can also click on the "Writing Excerpts" button to see other short stories, poems, and artwork done by the author. She took a deep breath in the moonlight to still her dancing nerves. She knew that it was just a matter of time before the dark thing would come across her in the cavernous catacombs that ran like veins throughout the great mountain. The light of the full moon fell through a crack in the stony ceiling, bathing the pathways, nooks, and crannies with its light. When it came to the offering, the evil creature would be easy to find. The beast had lorded over its ever growing treasure for as long as she could remember. Every year, it would venture up through the mountain to perch on its peak. From there, it would begin its journey to collect what it called a “peace offering” from every home that the moonlight touched. Every creature it came across was forced to pay. It was either that, or they would go up in a blinding hot burning that could incinerate any living thing instantly. If the inhabitants of the Mountain of Mondoom gave it something shiny; gold, or some other bauble, it would leave them alive. It was a tyrant, as far as she was concerned, and she was determined to be free of it. Many beings made their home here on the rock. In fact, the mountain range teemed with life, both inside and out. Her family, once in a vast clan, had made up many of those numbers, but now it was only her that called that particular cavern her home. Her siblings were gone, taken from her too soon because they did not understand what it had wanted of them. It had happened long ago, but she mourned their passing still, and would forever bear the mark of that encounter. This is why she had volunteered to be the one to try to stop the beast once and for all. The monster ventured out, and she moved to intercept it. Others had tried before her, and had fallen. She had watched and learned, and would not make the same mistakes. She was nervous as she travelled. To her, each fallen pebble sounded like an avalanche. The end for one of them was drawing near. She was depending on the element of surprise, but found it hard to hear the thing’s approach over the wild thrumming of her heart. She spied the slinking creature and watched as its angered gaze turned her way. It froze. She had been spotted. She swallowed hard as bile rose in her throat, the acrid taste flooding her mouth. Her eyes stung with the sudden blink of light in the darkness before her, the beginning of the white hot attack that would attempt to cremate her alive. She opened her mouth in protest, and hurled her own attack as the blazing heat came at her. 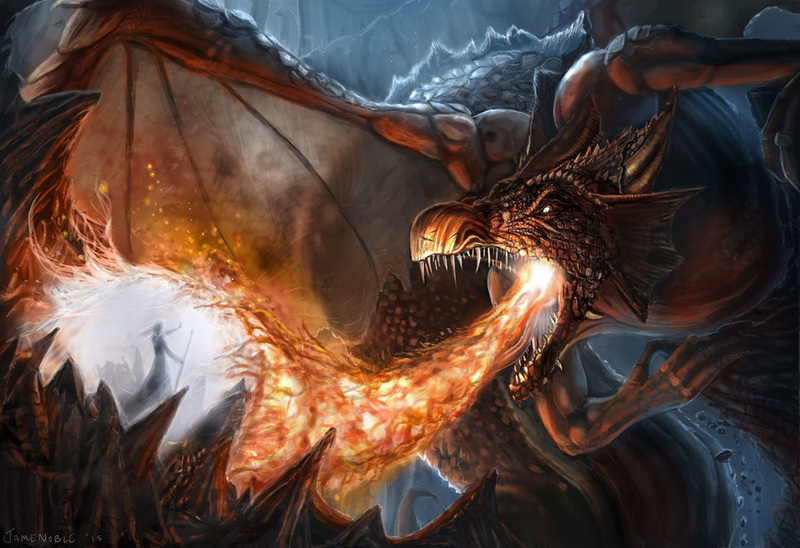 As the evil sorcerer’s scorching blast heated the air around her, her fire flew in a torrent from between her jaws, and the dragon wondered if it would be enough to free the land.